By 1849 Lawrence M. Van Wart lived at No. 140 MacDougal Street. A grocer, his store was just around the corner at No. 114 Amity Street, later renamed West Third Street. Van Wart's family's American roots reached back to the 17th century when the first Van Weerts arrived. Born on March 1, 1797 on Little Robinson Street, now Park Place, he served during the War of 1812 building city defenses. Shortly after the end of the war he opened his grocery business. He married Arabella Frost on August 10, 1820 and two years later the first of their three children, Lawrence, Jr. was born. His business was highly successful and years later The New York Times would mention he had "an ample fortune." In 1851 Van Wart demolished both his house and No. 138 next door, the former home of Joseph Allen. (Allen's residence may have been available because of financial difficulties. In 1854 he still owed outstanding personal taxes from 1844.) He replaced them with a pair of three-story, mirror-image Greek Revival homes, completed in 1852. There was little unusual in the red brick houses. Their wooden bracketed cornice, floor-length parlor windows and prim stone lintels were similar to hundreds of houses being built at the time. But the magnificent cast iron double porch over the shared brownstone stoop was anything but ordinary. Bearing striking resemblance to the porch at Nos. 3 and 4 Gramercy Park crafted a decade earlier, its lacy filigree gave the homes a personality unseen anywhere in the neighborhood. Van Wart and his family moved into No. 140. In 1856 they received a new address, No. 132, when the houses were renumbered. No. 138 became 130. Lawrence Jr. and his wife would move into No. 130 by, at least, the early 1860s. In 1855 Henry A. Thomas, a bank clerk, listed it as his address. He volunteered at the Empire Hose Company, No. 40 firehouse at No. 70 Barrow Street. It is unclear whether he leased a room or the entire house from the Van Warts. Lawrence Jr.'s profession was listed as "merchant" and in 1866 he, too, was volunteering in a fire house. His was the Amity Hose Company, No. 38, at No. 130 Amity Street, steps away from his father's grocery. It is unclear whether the younger Van Wart was living in No. 130 in 1858. Possibly Henry Thomas was still here and had a wife. Whichever, a tragedy occurred that year. On January 14 an advertisement in The New York Herald read: "Wanted--By a respectable married woman, who has recently lost her baby, a baby to wet nurse at her own home. Call at 130 Macdougal st., near Amity." Lawrence Van Wart, Jr. was highly active in politics and several times ran for Councilman. In the meantime his parents continued to live next door. In 1856 they were seeking a servant. The on February 21 announced "Wanted--In a private family, a German or colored girl, to do general housework; she must be a first rate washer and ironer and a good plain cook, and must come well-recommended." Lawrence Van Wart, Jr. was still listed at No. 130 in 1866. His parents seem to have been leasing a room by then. In 1862 George P. Brown, a music instructor, was living in No. 132. Two years later two Columbia College students boarded here. William Washington Smith was a sophomore that year, and continued to return through 1867. Theodore Pease Cook, whose home was in Utica, New York, was studying law. Like Smith, he graduated in 1867. An advertisement on April 29, 1866 offered "To Let--A small, genteel front and back parlor on first floor, with Board, to a gentleman and wife, at 132 Macdougal street, near Amity. Terms moderate." Next door at No. 130 another student was boarding. Nathaniel Burr Raymond was in the Introductory Class of the College of the City of New York. He took a room in 1866 and stayed on through 1869. Both Van Wart families left around 1868. In August that year No. 130 was offered "To Rent--A very desirable small three story House, in splendid order. Carpets and Oilcloths for sale." It continued to receive boarders under a new proprietor. In 1872 Rev. J. Rambo, rector of the Epiphany Church on Stanton Street was living here, as was William Murray, the 35-year old brother of Alderman John Murray. He died in the house on March 29 "after a long and painful illness" and his funeral was held here a few days later. By 1874 No. 130 had changed from a boarding house to a rooming house--a difference that, possibly, hinted at a change in the neighborhood. An advertisement that year offered "Furnished rooms to let--To gentlemen and ladies, with the use of bath and gas; also a hall bedroom." No. 132, too, was being operated as a rooming house. An ad in May 1871 offered "a few nicely furnished rooms for gentlemen." One of the renters at No. 132 was the victim of a burglary in the summer of 1870. Windows were left open in the summer heat, providing a tempting access. The New York Herald reported on August 22 "William Reilly, a cart driver, residing at No. 131 Macdougal street, was arraigned yesterday at Jefferson Market charged with entering the premises No. 132 Macdougal street through an open window on Saturday night, and taking from a room therein a quantity of clothing worth fifty dollars." Reilly had been spotted leaving the house with the clothing. The goods would be worth about $950 today. For awhile both houses continued to rent to respectable single men. But that all changed in 1891 when Tammany Hall agents leased both houses. They became lodging houses, the lowest form of temporary accommodations offering men a rented cot one night at a time. The Tammany machine was not interested in being a landlord, however. Its corrupt officials were interested in tipping the voting scales in favor of its candidates. Investigation revealed that drifters were paid to move into the houses, then register to vote as residents in the ward. The scandal led to a well-publicized trial with remarkable testimonies. "'Ah, yes,' said he pleasantly, 'I know you boys.'" Brown incriminated himself when he explained how the scam worked. "You see, we had been going it pretty strong from Nos. 130 and 132 Macdougal-st. early in the day and the Republicans were getting suspicious." When the cop asked "Are we safe? Will we be pinched? And if it comes to that will we be protected?" Brown replied "You are all right, my sons. I guarantee your safety. I take your protection upon myself." On October 17, 1891 the New-York Tribune reported "From the lodging-house Nos. 130 and 132 Macdougal-st. were registered on Wednesday eight men not one of whom is entitled to vote, the majority being non-residents of the State and all recruited from an East Side dive by Brown's lieutenants." The reputation of No. 130 was further soiled three years later when Lorenze Cravagh's photograph was posted in Police Headquarters's Rogues' Gallery. Around the first of April 1894 Cravagh approached a stranger, Luke Cappio, who was buying a steamship ticket to Europe. Cravagh invited him to No. 130 MacDougal Street saying he "had an important commission for him." Apparently naive and over-trusting, Cappio followed. Cravagh confided "I have a trunk here in which there is $40,000 in gold. I want to send it to some friends in Italy, and I want you to take charge of it. My friends in Italy will pay you handsomely when you deliver the trunk to them." Cappio agreed to the deal, but there was a catch. According to The Sun on April 29, 1894, "Cravagh then said that it would be necessary for Cappio to leave a deposit of $200 with him as security for the $40,000. Cappio thought this was reasonable and gave his acquaintance the money." Cappio received the trunk on April 20, the day before his ship was to sail. The trunk was so heavy it took four men to lift it. What Cravagh had not anticipated was that Cappio's curiosity would get the best of him. He so wanted to see what $40,000 in gold looked like that he broke open the trunk. It was filled with bricks. On Friday night, April 27, police arrested Cravagh in the MacDougal Street house. "He denied that he had received $200 from Cappio," reported The Sun. Things were even worse next door at No. 132. It was being watched by police and reformers as a brothel. Finally, during a two week period in November 1895, William L. Soyer, who ran the private Soyer's Detective Agency, visited about 15 bordellos gathering evidence. On November 22 he went to No. 132 MacDougal Street. He testified before a State Senate investigative committee on December 5. When he was asked "And in all these houses of ill-fame you found girls?" he had to admit that there were no prostitutes at No. 132 when he entered, but insisted it was a brothel nonetheless. "They were not doing any business, but that is a house," he said. And, indeed, in May the following year the Society for the Prevention of Crime listed No. 132 MacDougal Street on its list of Houses of Assignation. Being documented as a brothel in the late 19th century did not necessarily result in being shut down. Not only did No. 132 continue to house a bordello, run by "Madame Herman," she expanded into No. 130 by the turn of the century. On March 2, 1903 The New York Times reported on raids conducted by Police Captain Gorman. Included were the "houses of which Mme. Herman is said to be the proprietress, at 130 and 132 Macdougal Street." The MacDougal Street neighborhood in the first half of the 20th century was mostly one of Italian immigrant families who lived in the many tenement buildings. On October 16, 1935 No. 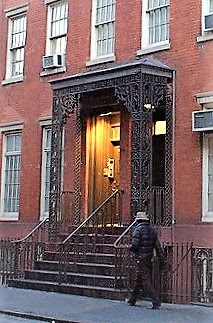 132 MacDougal became home to "Mothers of Today," described as an institute founded "to debunk the ancient myth" that all mothers are good mothers. Interestingly, one of the leaders was businesswoman Alice Foote MacDougal. A coffee wholesaler and owner of cafes, she was reportedly the only "woman expert in coffee grading and blending" in the nation. Mothers of Today embarked on a program of training neighborhood mothers on the proper rearing of children. Its director, Dr. Ellaine Elmore, explained that merely having "managed to have offspring" did not make a mother. "Let us debunk this ancient myth once and for all. There are good mothers, bad mothers, indifferent mothers, diligent mothers, intelligent mothers and ignorant mothers." By mid-century No. 132 was again a private residence. It became home to James A Leftwich and his new bride the former Ilka Renwick Campbell following their September 1, 1947 marriage. Leftwich was an author and public relations counsel with a notable athletic past. In 1924 he won the United States amateur and intercollegiate middleweight boxing championships, the same year that he went to Paris as a member of the Olympic boxing team. His wife was a sculptor whose work had been exhibited not only in New York, but in South America and Europe. Her great uncle was architect James Renwick, Jr. famous for his masterpieces like St. Patrick's Cathedral, Grace Church and the Smithsonian "Castle." In 1983 both houses were purchased by New York University. A renovation completed in 1988 was described in Building Department documents as a dormitory for its Law School. The university's website repeats the often told legend that Louisa May Alcott lived here and wrote Little Women in No. 130. Cast iron balconies may have originally graced the parlor floor openings. Perhaps more than any other neighborhood in Manhattan, Greenwich Village is rife with romantic lore about its houses and buildings. Like the story that the building housing the restaurant "One if by Land" was once Aaron Burr's carriage house, there is no documented basis (or feasibility) for the Alcott legend. Fact will not, however, squelch the beloved Village tale.